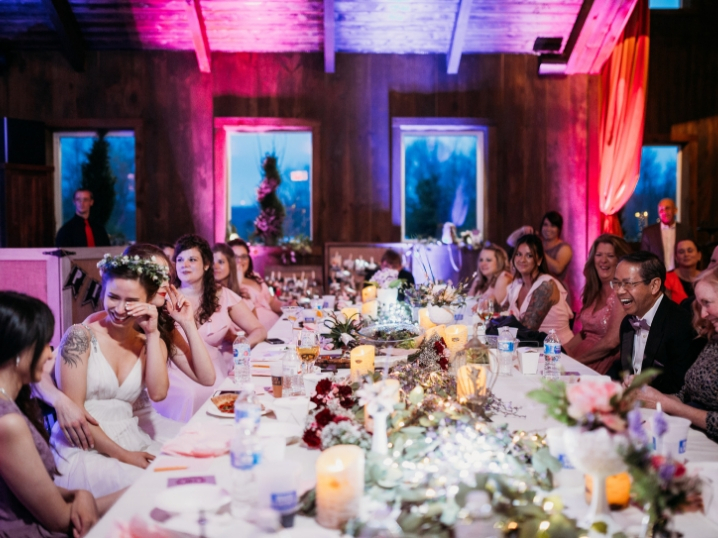 When you’re planning a wedding, there’s roughly 700 items you need to check off on your list – sending out invites, ordering centerpieces, doing the seating chart, redoing the seating chart once you realized you put your divorced aunt & uncle next to each other. Don’t let your wedding guest book get lost in the to-do list shuffle! Printing black text on our Wood Print Wraps looks awesome – the deep black is such a nice contrast on our light grain wood. 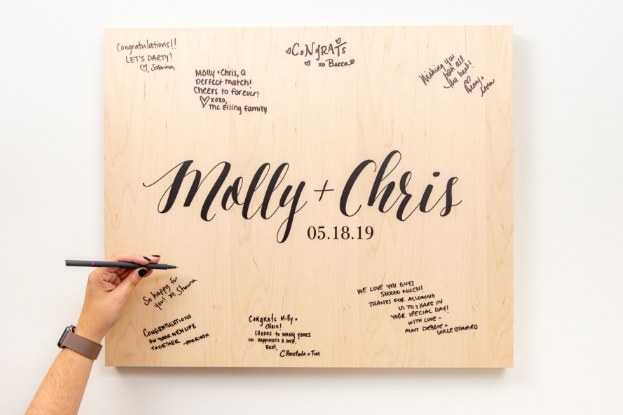 Plus, since every piece of wood features a different wood grain, you’ll have a truly unique guest book. To design text for your Wood Print, use a online design tool like Canva, which is free, and then download as a JPEG. Recommended pens: Fine Point Sharpie, Ultra Fine Point Sharpie, Craftsmart Paint Pen. 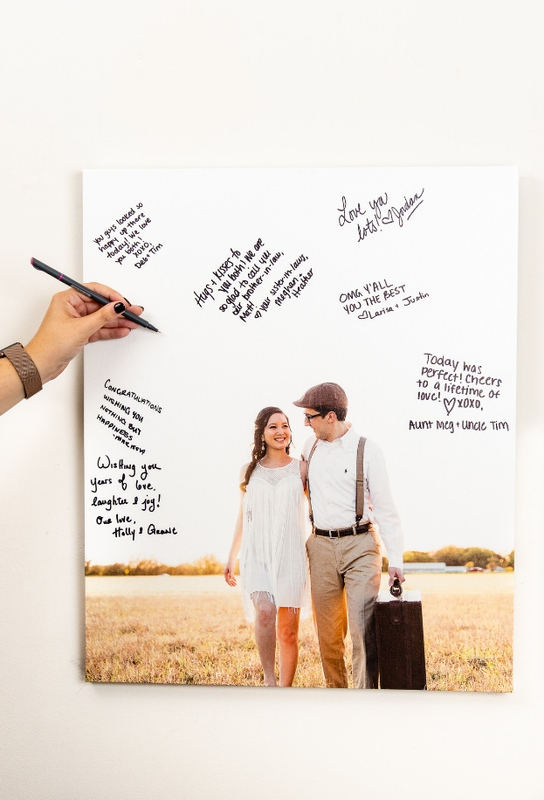 Make Van Gogh jealous by making your guest book on a Canvas Print. Pick an image from your engagement shoot with a lot of white space at the top and you’ll create a piece that’s full of memories. Recommended pens: Fine Point Sharpie, Ultra Fine Point Sharpie, Craftsmart Paint Pen. If your engagement shoot pictures feature high contrast images (like the water and sunset in the picture above! ), print your guest book on Metal. The colors will look more brilliant, and your guest book will transform into a work of art. Recommended pens: Fine Point Sharpie, Craftsmart Paint Pen. 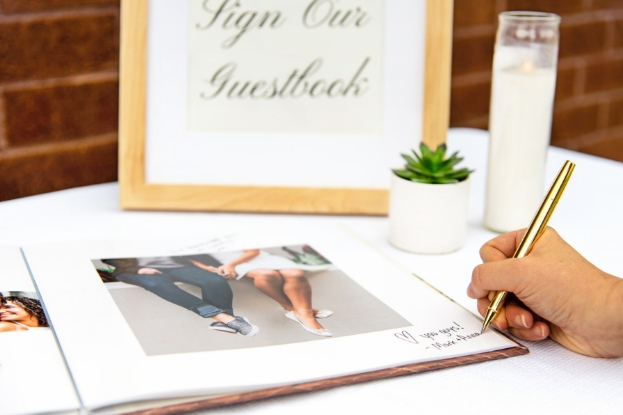 Give your guests the freedom to write in a photo book. With the ability to add pages, you’ll be able to read through heartfelt notes that sit alongside your treasured photos. Recommended pens: any Sharpie will do! Which alternative guest book is your favorite? Let me know in the comments! Thank you to I Dream In Flowers, Monica Roberts Photography, and Hannah Marilyn Photography for their imagery in this post and on our products! There is simply no better way to commemorate one of the best days of your life than to put the best memories in print. 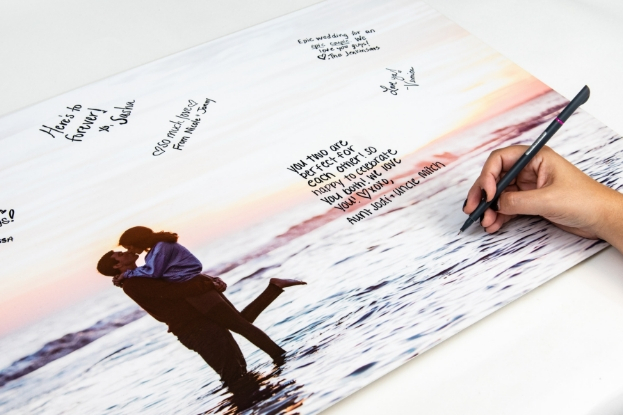 Making your wedding guest book on canvas print a unique change from the traditional guest books. They are sure to become a treasured family keepsake and a piece of art you will be proud to display after the big day.